German States stamps for the Kingdom of Hannover were first issued in November of 1850. From 1714, the Electorate of Hannover was joined in a "personal union" with Great Britain, when the Prince Elector of Hannover, George Ludwig, became King George I of Great Britain. Following the defeat of Napoleon, in 1814, Hannover became a kingdom, and King George III of Great Britain became the king of Hannover. Oddly, King George III grew up in Britain, his native language was English, and during his long life, he never visited Hannover. Until 1837, all British monarchs were also the Kings of Hannover. 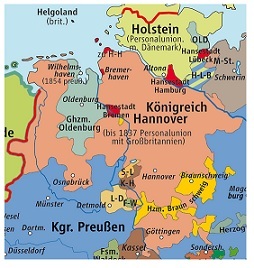 A map of the Kingdom of Hannover is shown at the upper left. When King William IV of Great Britain and Hannover died in 1837, his niece, Alexandrina Victoria, succeeded him as the Queen of Great Britain. Hannover, however, did not allow female monarchs, so she could not assume the titles that her predecessors had. As a result, the "personal union" of Great Britain and Hannover ended. Ernest Augustus became the King of Hannover in 1837, and he was the monarch, when the first German States stamps for Hannover were issued. His son, George, succeeded him in 1851, as King George V of Hannover, and he reigned until 1866. In 1866, following the Austro-Prussian War, Hannover was annexed by and became a province of the Kingdom of Prussia. The two banners above should be familiar to just about everyone. On the left is the Royal Standard of the "Personal Union" of the United Kingdom and Hannover. The four quadrants depict the arms of England, Scotland, Ireland, and Wales, with the crowned arms of the Kingdom of Hannover in the middle. This standard was in use from 1814 to 1837. On the right is the Royal Standard of the United Kingdom, which has been in use since 1837. It features the arms of England, Scotland, Northern Ireland, and Wales, with the omission of the arms of Hannover in the middle. This banner is still the Royal Standard of the British monarch, to this day. The two German States stamps for the Kingdom of Hannover shown above were issued between 1850 and 1855. The stamps are typographed and they are printed in black on tinted paper. The 1 Ggr. denomination stamps featured the Hannoverian Coat of Arms, with the denomination in the center. The catalog attributes, for stamps that are watermarked Square Frame, are as follows. 01 Ggr. (1850 - Mi. #1, Sc. #1) - Black on Light Grayish Blue to Bluish Gray. The catalog attributes, for stamps that are watermarked Oak Wreath, are as follows. 01 Ggr. (1851 - Mi. #2a, Sc. #2) - Black on Olive Gray to Light Grayish Olive (Gray Green). 01 Ggr. (1855 - Mi. #2b, Sc. #2a) - Black on Light Gray Green (Sea Green). The simple drawing shown above is from the "Serrane Guide", and it illustrates the major differences between the 1 Ggr. denomination originals and forgeries. Upon close examination, differences can also been seen in the designs at the top of the stamp. The forgery of Mi. #1 shown above was originally used as the image of Mi. #1 on this page. One of my website visitors from Germany recently contacted me and informed me that the stamp in the image was a forgery. One can never be too careful, when acquiring a new stamp for their German States collection. It is always wise to evaluate new stamps, especially those that have not been previously authenticated. 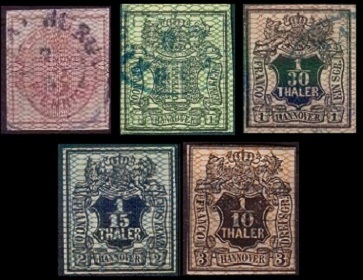 The three new denominations of German States stamps for the Kingdom of Hannover shown above were issued between 1851 and 1855. These stamps are also typographed, and they are printed on tinted papers with an Oak Wreath watermark. 1/30 Th. / 1 Sgr. (1851 - Mi. #3a, Sc. #3) - Black on Light Reddish Orange (Salmon). 1/30 Th. / 1 Sgr. (1855 - Mi. #3b, Sc. #3a) - Black on Light Rose Lilac (Raspberry). 1/15 Th. / 2 Sgr. (1851 - Mi. #4, Sc. #5) - Black on Grayish Turquoise (Grayish Blue). 1/10 Th. / 3 Sgr. (1851 - Mi. #5, Sc. #6) - Black on Light to Dark Reddish Yellow (Dark Yellow). 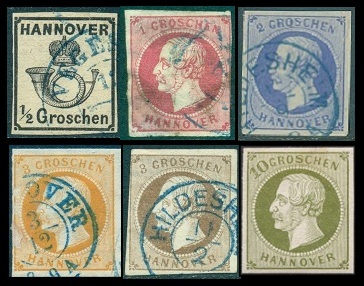 The original printings of all the German States stamps for the Kingdom of Hannover shown above have colored gum. The reprints have white gum. There are also bisected usages of the 1/30, 1/15, and 1/10 Thaler denominations. The 3 Pf. denomination stamp shown above, at the left, was issued on April 15, 1853. This stamp is printed on white paper with an Oak Wreath watermark. The new design features a crown and the denomination, within a large oval. 3 Pf. / 1/3 Sgr. (1853 - Mi. #6, Sc. #7) - Light Reddish Carmine, Light Lilac Carmine. During December 1855, the 1/10 Th. denomination stamp shown above, at the right, was re-issued on white, unwatermarked paper, and then it was overprinted with a closely-meshed network. 1/10 Th. / 3 Sgr. (1855 - Mi. #7, Sc. #8) - Black on Light to Dark Yellow with an Orange Network. 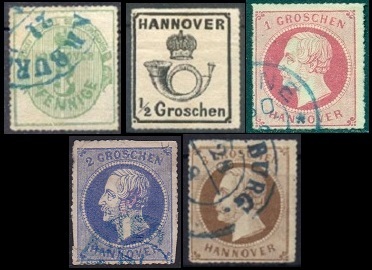 All of the contemporary German States stamps for the Kingdom of Hannover as shown above were re-issued during 1856. These re-issued stamps are printed on unwatermarked paper, and they are all overprinted with widely-meshed networks in various colors. 3 Pf. / 1/3 Sgr. (1856 - Mi. #8, Sc. #9) - Light Reddish Carmine on White with a Grayish Network. 01 Ggr. (1856 - Mi. #9, Sc. #11) - Black on Olive Gray to Light Grayish Olive with an Olive Green Network. 1/30 Th. / 1 Sgr. (1856 - Mi. #10, Sc. #12) - Black on Light Rose Lilac (Raspberry) with a Reddish Carmine Network. 1/15 Th. / 2 Sgr. (1856 - Mi. #11, Sc. #13) - Black on Grayish Turquoise (Grayish Blue) with a Grayish Ultramarine Network. 1/10 Th. / 3 Sgr. (1856 - Mi. #12, Sc. #14) - Black on Light to Dark Reddish Yellow with an Orange Network. The reprints of these stamps have white gum, and the overprinted networks do not cover the outer margins of the stamps. Between 1859 and 1863, the 3 Pf. denomination German States stamps for the Kingdom of Hannover shown above, were re-issued on white, unwatermarked paper, but these stamps do not have the network overprint. 3 Pf. / 1/3 Sgr. (1859 - Mi. #13, Sc. #16) - Reddish Carmine to Carmine Red. 3 Pf. / 1/3 Sgr. (1863 - Mi. #20, Sc. #17) - Olive Green. A brand new series of definitive German States stamps for the Kingdom of Hannover was introduced, beginning in 1859. These new stamps, shown above, are imperforate, and they are printed on white, unwatermarked paper with rose colored gum. The 1/2 Gr. denomination features a crown over a posthorn. The other denominations all feature the left facing portrait of King George V of Hannover (Lived: 1819-1878, Reigned: 1851-1866). 1/2 Gr. (1860 - Mi. #17, Sc. #18) - Black. 1 Gr. (1859 - Mi. #14, Sc. #19) - Reddish Carmine to Lilac Carmine. 2 Gr. (1859 - Mi. #15, Sc. #20) - Dark Violet Ultramarine. 3 Gr. (1859 - Mi. #16, Sc. #22) - Dark Orange Yellow. 3 Gr. (1861 - Mi. #19, Sc. #23) - Dark Ocher Brown. 10 Gr. (1861 - Mi. #18, Sc. #24) - Dark Greenish Olive. The reprints of the 1/2 Gr. are on thick paper with yellowish gum. The reprints of the other values have white or pinkish gum. The contemporary 3 Pf., 1/2 Gr., 1 Gr., 2 Gr., and 3 Gr. denomination stamps were re-issued in 1864. They are printed on paper with "Perce en Arc" 16 separation between the stamps, as shown in the image above. (The 2 Gr. image was contributed by Bill Cottun). These stamps utilized both white (Mi. suffix "x") and rose (Mi. suffix "y") colored gum. The printings with rose colored gum are much scarcer. 3 Pf. (1864 - Mi. #21x,y, Sc. #25, 25a) - Dark Olive Green. 1/2 Gr. (1864 - Mi. #22x,y, Sc. #26, 26a) - Black. 1 Gr. (1864 - Mi. #23x,y, Sc. #27, 27a) - Reddish Carmine. 2 Gr. (1864 - Mi. #24y, Sc. #28) - Dark Violet Ultramarine. 3 Gr. (1861 - Mi. #25x,y, Sc. #29, 29a) - Dark Ocher Brown. In 1866, the German States stamps for the Kingdom of Hannover were replaced by those of the Kingdom of Prussia, and later by those of the North German Postal Union.